On Wednesday, November 9, thousands of people unhappy over Donald Trump being elected president stepped out to protest in cities across the U.S., clashing with police in Oakland, California, and even shutting down the busy 101 Freeway in downtown Los Angeles. At least 13 people were arrested in Los Angeles in a traffic backup that extended for miles, the Los Angeles Times reports, after a crowd stormed the freeway, which links downtown L.A. to Hollywood, at about 10 p.m. local time. Police wearing riot gear urged the demonstrators to leave, but the crowd refused, waving U.S. and Mexican flags, raising their arms and chanting, "Hands up; don&apos;t shoot." 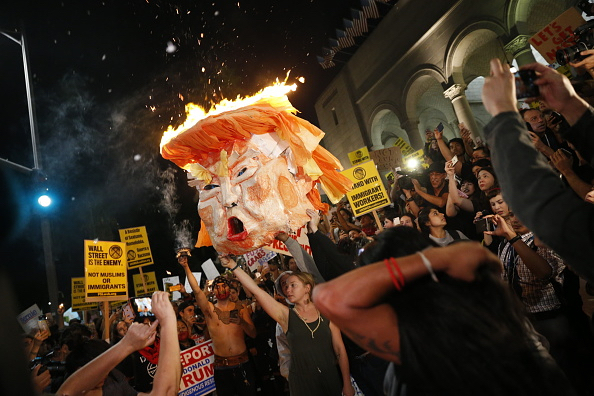 Some drivers were trapped in their cars, and authorities were hopeful that the freeway would be cleared by 3 a.m.
A group of protesters also rallied in front of L.A.&apos;s City Hall and burned a giant Trump head in effigy in protest over the real estate mogul&apos;s win. Some climbed up traffic poles and on top of bus stops, while others spray-painted graffiti onto the L.A. Times building and TV news vans. Meanwhile, in downtown Oakland, California, one demonstration with an estimated 7,000 people turned violent as protesters lit fires in the streets, burning at least one police car, smashed windows in buildings, including City Hall, and looted businesses. SFGate.com reports that police wearing riot gear used tear gas to disperse the crowds and that some protesters were arrested after scuffles that saw rocks, bottles and Molotov cocktails thrown at authorities. One officer was injured, according to ABC 7. In New York City, at least 62 people were arrested as thousands took to Fifth Avenue, waving signs that said "Love Trumps Hate" and chanting "Hey hey ho ho, Donald Trump has got to go" as they headed to Trump Tower to protest the former reality TV star&apos;s defeat of Hillary Clinton, according to the New York Post. The New York Daily News reports that a wall of police blocked protesters&apos; efforts to enter Trump Tower, and that an American flag was burned outside the building, although it was unclear if the president-elect was inside. Protests also took place in Chicago; Austin, Texas; Portland, Oregon; San Francisco; and in front of the Trump International Hotel in Washington D.C.
As Us Weekly previously reported, celebrities also got involved in the protests, with Mark Ruffalo posting an Instagram video of protesters outside Trump Tower in Manhattan, and Madonna sharing a clip of thousands of people shouting "Not my president!" in the middle of NYC.